For my Friday Five this week, I've decided to focus on five specific things I am grateful for. 1. 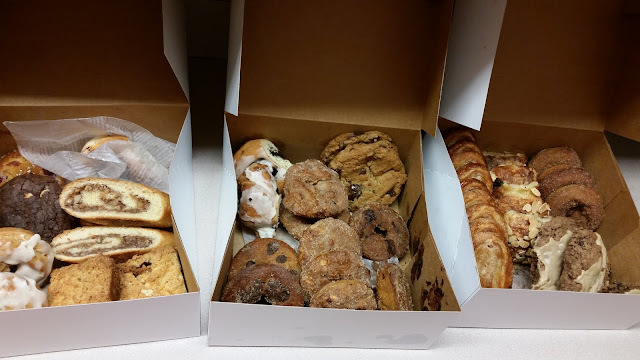 I am grateful for deliciously sweet pastries leftover from an event at work. Enough that I can eat as many as I want without feeling greedy. Ha! 2. I am grateful for cooler weather so I can wear pants and not have to shave every day. That's five minutes of my day I can devote to something (anything) else. 4. I am grateful the task of taking the AC unit out of the bedroom window has been completed. It is not something I can do myself, so I had not been looking forward to having to ask for assistance, but fortunately it turned out to be relatively pain-free. 5. I am grateful it's Friday, which means I get to spend the next two days with my little man. Hugs and kisses and boogers and books. Nice things to be grateful for. I am grateful for you, you little man, your sister, her little man, my beloved husband, trees, sky, weather, a husband who is going to cook dinner tonight for the third night in a row (maybe because I am taking to long to get started, but still . . ) and grateful that at one time I was able to enjoy sweets and that now that I can;t, my husband can't, either, so is less likely to tempt me. And . . should I go on?